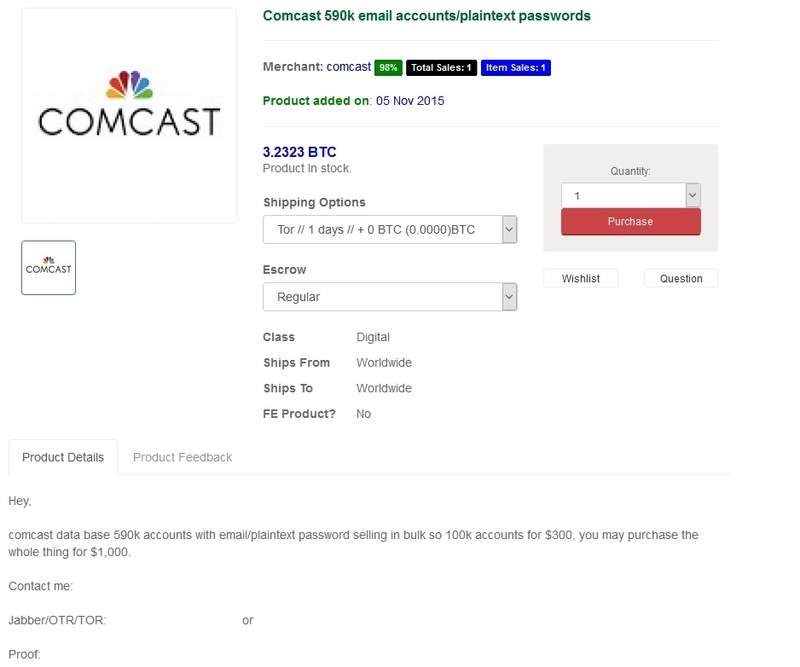 5,90,000 Comcast email addresses and Passwords are on sale at Dark Web! Comcast is an American multinational mass media company. This weekend nearly 5,90,000 email addresses and passwords of Comcast users were offered for sale on BlackMarket in the Dark Web. When the other users of Dark web ask the seller for proof then he publishes a list of 110 accounts. The seller was demanding $300 for 1,00,000 accounts. For the entire list of accounts seller gave a offer of $1000. It was a list of complete 5,90,000 accounts in actual. The cybercriminals represent a small part of large information, but we can’t underestimate the fact that credentials offered could be used by hackers to changeover the Comcast accounts. Security team of Comcast said, “The computer systems of Comcast have not been compromised.” They also said that they will fix the suspicious activities on their user’s account which has report about it. Here the fact is, the systems of Comcast are safe but hackers were getting credentials of users through other online access services. This happens due to those users which set the same passwords for all online services. Hackers know very well about this bad habit of the users. It is easy to find online from where this data collection is coming. If hackers got the access of any online service, they often try the same credentials on other online services. So, the systems of Comcast were safe and the security team has reset near about 2,00,000 accounts after this incident.